joy magnetism: Do you know the way to La-la Land? Another sale magnet from the Met. I think I might singlehandedly be supporting their magnet sales. As I was looking at my little fridge magnet art gallery, I realized I have a couple of Hoppers, well, in the hopper, so to speak. 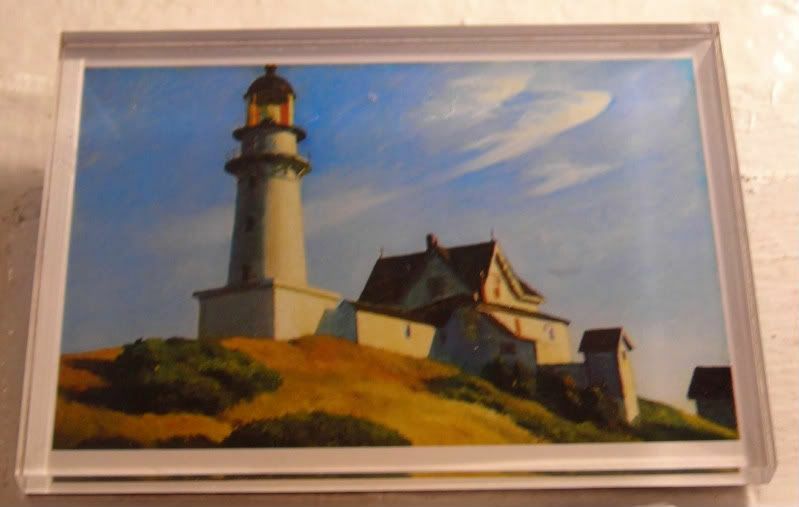 So I won't wax poetic about Hopper's work in general, and how meant for Lighthouse at Two Lights (Maine) to stand for the individual's stand against industrialization. One, because I don't totally get it, but also because really? fight against industrialization? But, a twofold reason why I picked this one today. One, because I kinda like the idea of the lighthouse sitting as a bastion of hope on this promontory. And, two, because of the amount of sky in the painting. The ones who have their head in the clouds, going about their merry little way singing their happy la-la-la's. And those behind them, who have their noses to the ground, scurrying about, just trying to pick up the pieces.